LeBron James will not face the Bucks. LeBron James and Giannis Antetokounmpo will both sit out Tuesday's game between the Los Angeles Lakers and the Milwaukee Bucks. James has been ruled out with groin soreness, the Lakers announced, while Antetokounmpo is nursing a sore ankle that had left him questionable for the game. The Bucks confirmed that as well as Antetokounmpo, who is listed as day to day, Sterling Brown, Pau Gasol and Donte DiVincenzo will also not feature. After being rested on Friday against the Detroit Pistons, James played on Sunday in the defeat to the New York Knicks. 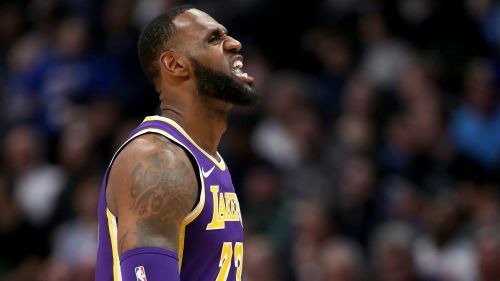 With the Lakers on the verge of missing the playoffs, the four-time MVP has seen his playing time already reduced to a career-low 35.3 minutes per game. The Bucks, who sit on top of the Eastern Conference with a 52-18 record, will be hosting the Lakers (31-39) in Milwaukee.